(Bloomberg) -- A third regional Federal Reserve factory survey this month showed weakness in new orders, adding to signs of a global slowdown in manufacturing. 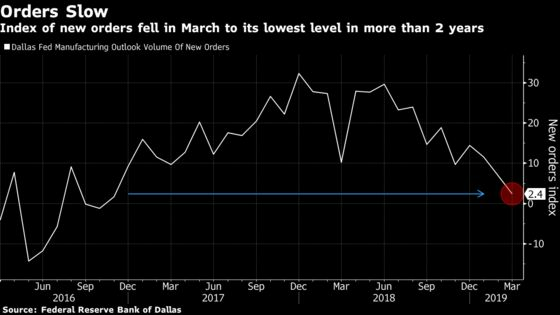 The Dallas Fed said Monday that its index of new orders fell to 2.4 in March, the weakest reading for the gauge of Texas factories in more than two years. The reading comes on the heels of soft new-orders readings from the New York Fed’s Empire State survey and the Philadelphia Fed’s regional gauge. A separate Dallas Fed index measuring the growth of new orders dropped into negative territory for the first time since December 2016. Comments from the Texas survey respondents were mixed, including references to declines in international sales and struggles to attract skilled labor, while others continued to see strong demand. In survey responses, one unidentified manufacturer of fabricated metal products complained that there’s too much capacity and too few orders. Another in the industry said its inability to hire and train new workers has become more problematic. For others, the slowdown in orders and the tight labor market have proven no issue. One producer in textile products said it continues to grow and thrive, while a food maker said it still sees strong demand and expects to increase production by at least 25 percent during the next six months.